I thought I knew something about accepting help when a newborn arrives. But then last Sunday’s I wonder why my stomach hurts… turned into maybe we should go to urgent care? to that appendix needs to come out stat and the surgeon is waiting for you in the operating room. Nothing like an emergency appendectomy to land a postpartum mom right back where her summer started. Recovering, recuperating, resting in bed. For five days straight I didn’t change a diaper. Didn’t run a single load of laundry. Didn’t read a single book to my big kids, cook a single meal for our family, or even brave the painful walk downstairs. I needed help to do everything. And I had to learn the practice of acceptance all over again. When I first wrote this post two weeks ago, accepting help meant reflecting on my gratitude for all the generous care people shared with us after Joseph arrived. Since the moment of his birth, we’ve been blessed with help. Friends and neighbors brought dinners to share and offers to babysit. My sainted mom came to stay with us for three weeks, cooking and cleaning and baby-whispering and big-kid-entertaining as only a grandma can do. And my in-laws snuck the boys away for afternoons or mornings so I could catch up on sleep or simply tend to the baby. But it took a serious setback – a week where everything fell apart, not just mama’s health – for me to remember my utter reliance on others. What a tough lesson it is to remember. Whenever Moses held up his hand, Israel prevailed; and whenever he lowered his hand, Amalek prevailed. But Moses’ hands grew weary; so they took a stone and put it under him, and he sat on it. Aaron and Hur held up his hands, one on one side, and the other on the other side; so his hands were steady until the sun set. What I love about this story isn’t the magical power of Moses to win battles. It’s the sweaty, aching, all-day-long reminder that to do the work we’re called to do, we need others to hold us up. When I was still in the hospital, groggy from pain meds and aching all over, I tried to nurse the baby again, for the first time. But with incisions all over my stomach, I couldn’t even cradle him across my lap. So my husband had to cup the baby’s head in one hand and wrangle his wriggling feet in the other hand, to keep him from kicking my tender scars. All I could do was sit there. With tears streaming down my face. And let him help me, ironically, do the thing that only a mother can do. The truth is that I always need help to do this work well. Take the case of the summer babysitter. Our family’s routine runs on a rhythm that has always involved help with child care, and now is no exception. When the sitter is here, I can clean, cook, write, run errands, nap or simply tend to a needy newborn. All of which is good and necessary for our family. I’m learning to be a mom of three, and this cheerful college sophomore is helping me do that, two mornings a week. Thank God for her help. But interdependence is never the easiest lesson for us to learn, is it? We independent Americans. We people-pleasers. We do-it-all multi-taskers. In a time when you give so much – when you have given everything, in fact, yourself, your sleep, your blood, your milk, your sweat, your time, your energy – the hardest part can be accepting that you cannot give it all. That you depend on help from others. And that this might be exactly the way God created things to be. 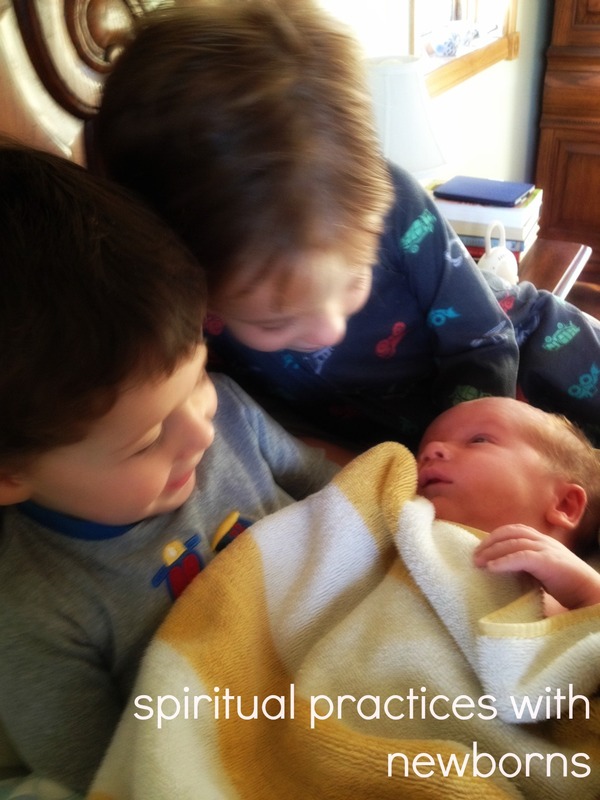 This time around the newborn bend, I have to accept help as a spiritual practice. Even when I had an easy recovery from birth, I still needed my midwives, an amazing lactation consultant, our rock-star pediatrician, and our peppy babysitter to make life with baby possible. And now that I’m back to healing mode – forced to put my feet up and climb stairs slowly and ask someone else to lug around that bulky car seat – I’m relearning how to embrace humility. To surrender to the truth that I can’t do it all. Because it was never all mine to do. God whispers, nudges, nods and reminds me – through the triage nurse and the ER doctor and the next-door neighbor and the smiling grandma – that we get through this world by the help of others. Again and again, my hands grow weary with this work I’m called to do. Thank God there are so many others to help hold them, steady at my side until the sun sets. Such a gift, to have armfuls of help, even when we hurt. If I only have the grace to accept it. For a new twist: the next time someone offers you help, don’t apologize or protest that you don’t need it. But simply accept, with deep gratitude. How does it feel to accept when you cannot give back in return? It’s humbling to accept help. Sometimes I feel bad asking for help knowing that a lot of people busy with their families. But I also remind myself that someday (when my babies are older) I’ll be the one able to help out other mothers. I tend to take care of everything myself, because really, for a long time, we (my husband and I) were all we had. Within that context, I would still take care of everything and never ask for help. I feel guilty. God grant me the grace to humbly accept the help that is offered and freely given. Such a horribly difficult time for you!! Many prayers and a meal brought to you soon! It is so hard to accept help! Hope you are recovering quickly now. Hope you are doing better, Laura! Through divorce I’m learning a whole different way of accepting help. Financially. I’ve had friends buy me lunch and dinner and coffee and I almost feel this sense of ‘poor you’, but then I remember how many times I’ve bought them or someone else coffee or lunch or coffee and just did it out of love. A desire to give to someone can be so strong. I’m trying to be gracious and allow it to happen and yet…. it’s hard for the giver to receive in this way.